Donald has appeared as a featured speaker at many different venues, including Modernism Week in Palm Springs, the Pacific Northwest Flower & Garden Show in Seattle, the Bloedel Reserve on Bainbridge Island, the Portland Garden Club, and at many other gardens, garden clubs, and bookstores. He has also been a featured guest on radio and television shows such as Frommer's Travel Show, "In the Garden with Mike D'Arcy" and AM Northwest. Below you will find a gallery of Donald's most recent public presentations. Celebrate the achievement of great women gardeners! In his newest presentation, “Garden Goddesses: Four California Women and Their Legendary Gardens,” popular garden writer Donald Olson takes you on an informative and entertaining tour of four spectacular California gardens and introduces you to the remarkable women who created them. You’ll meet Kate Sessions, the “Mother of Balboa Park” in San Diego; Florence Yoch, who designed dreamlike gardens for Hollywood moguls and the garden sets for Tara in “Gone With the Wind”; Virginia Robinson, creator of the first garden estate in Beverly Hills, scene of star-studded Hollywood parties; and Ganna Walska, a flamboyant opera singer who used her immense wealth to create Lotusland in Santa Barbara, considered by many to be among the top ten gardens of the world. Passion, ambition, determination—every great garden has a human story to tell. In this popular presentation, award-winning travel writer and author Donald Olson takes you on a tour of four remarkable Pacific Northwest gardens and introduces you to the five remarkable women who created them. Meet Hulda Klager, a housewife who became one of the world’s leading lilac hybridizers; Eulalie Wagner, a socialite who created one of the great estate gardens of Washington State; Elizabeth Lord and Edith Schryver, the first female landscape designers in the Pacific Northwest; and Lilla Leach, an intrepid plant explorer and botanist who founded her own botanical garden. 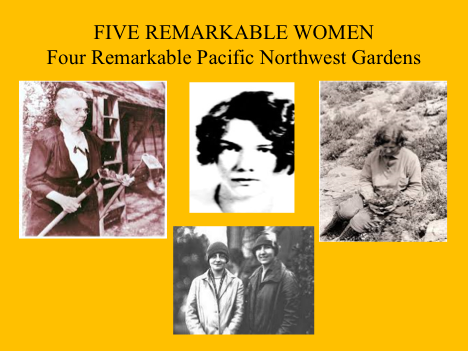 Donald’s most popular presentation, "Five Remarkable Women..." has been seen at major garden events and garden clubs throughout the Pacific Northwest. First presented at Modernism Week 2018 in Palm Springs, this informative and entertaining presentation traces the history and evolution of West Coast gardens and garden design from the Spanish missionary gardens of the late-eighteenth century to the grand garden estates of the Gilded Age and the revolutionary garden designs that emerged after World War II and created a midcentury modern garden aesthetic that has never gone out of style.